These heartwarming and inspiring Guideposts Junction stories will serve to help kids who are on their individual paths to fulfilling their own potential. 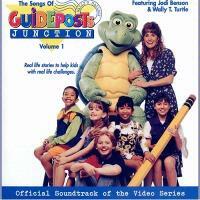 Using actual letters written in to GUIDEPOSTS MAGAZINE, Jodi Benson, Wally T. Turtle, and their friends tell stories that illustrate how to live according to the Bible. They make the whole experience great fun through the incorporation of song, dance, and honest discussions. The videos are not available on this site, but the songs are! Scroll down and click on the song titles below for LYRICS and more DETAILS. Yes! I Can Do It!